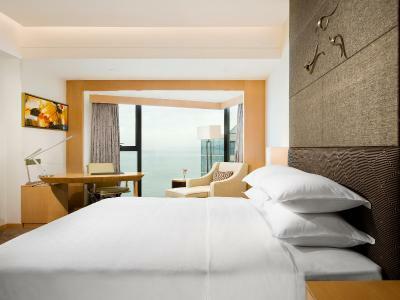 Lock in a great price for Sheraton Yantai Golden Beach Resort – rated 8.2 by recent guests! takes forever to get the room ready for check in...answer was always: sorry, we don't have enough manpower to do that. Should I really care? Everything was perfect and very comfortable and we enjoyed the friendly staff and well managed facilities and nice things to do in the hotel. The restaurants were also great although it was difficult to find seats. Our room temperature was a little too high and we could not make it cooler. The beach is just 1 minute walk from the hotel. Hotel staff is very friendly, polite and speaks good English. The breakfast was good and had a lot of choices, also the lunch and dinner buffet. The sea view from my room and also from the buffet restaurant was beautiful! when online booking, it was with breakfast, but when reach there the receptionist said no breakfast with what I book and pay. 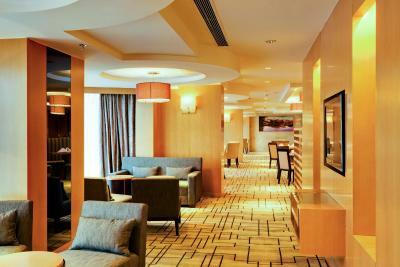 I was initially given a room that wasn’t to my specification but after having a word with front desk she immediately rectified the problem without any hesitation whatsoever. The staff were all polite and professional. The Filipino three piece band was worth listening to. 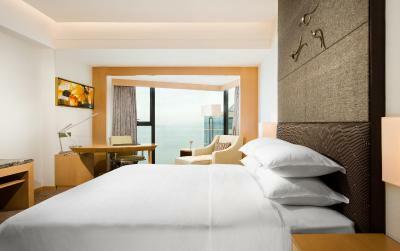 Check In was quick and friendly, staff was very helpfull especially greetings to Momo Song who made feel very welcomed ! Номер чистый, укомплектован всем необходимым, уборка ежедневно. Вода ,предметы личной гигиены добавлялись и менялись ежедневно. Тихо. Вид на море из панорамного окна. 시설이 깨끗하고 잠자리도 편했고, 직원들도 친절했습니다. 호텔뒤에 바다가 있어 산책도하고 여가를 즐길수있어 너무 좋았습니다. 11원달에 또 투숙 할 예정입니다. 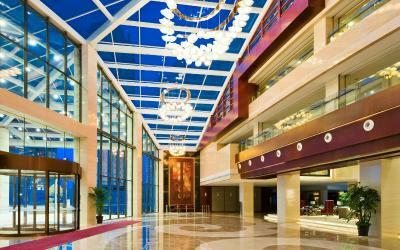 One of our top picks in Yantai.Sheraton Yantai Golden Beach Resort is located across from Golden Beach, 1.2 mi from the leisure zone. 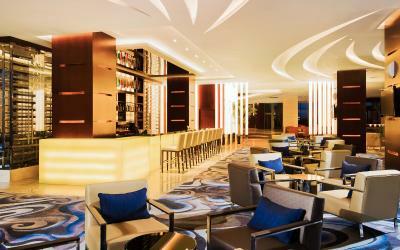 It features an indoor pool, 4 dining options and a variety of recreational facilities. 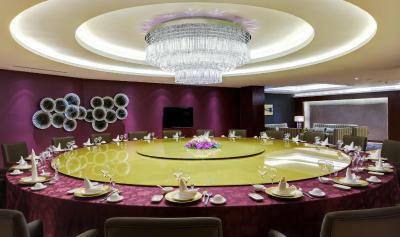 Sheraton Golden Beach Resort Yantai is a 30-minute drive from Yantai Museum and a 35-minute drive from Changyu Wine Culture Museum. Yantai Railway Station can be also reached by a 30-minute drive. 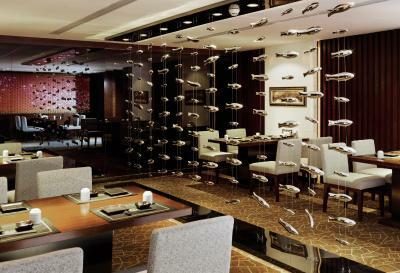 Penglai International Airport is a 40-minute drive away. 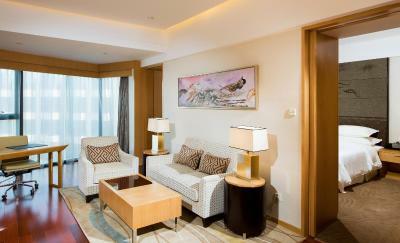 Stylish rooms come with elegant modern interiors and warm lighting. 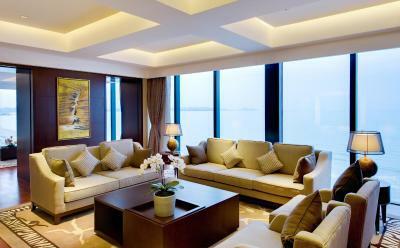 All the well-appointed units are equipped with a flat-screen TV and a cozy sofa seating area. 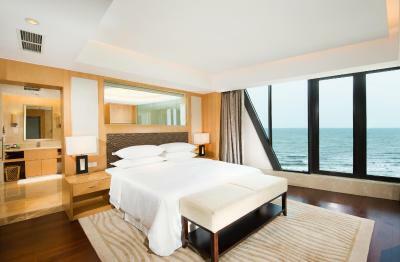 Some units also feature panoramic views of the sea. Guests can play a game of tennis, exercise at the gym, or indulge in a relaxing body massage. Staff at the 24-hour front desk can assist with ticketing and car rental services. 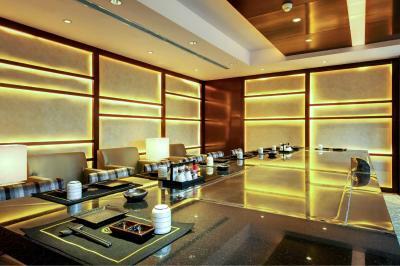 Feast restaurant serves a variety of international dishes, while Miyabi restaurant offers Japanese food. 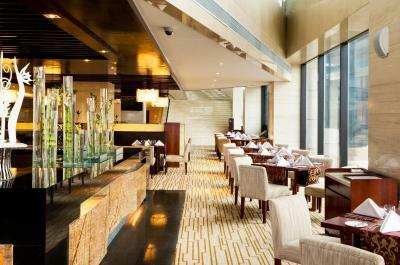 Other dining choices include Chinese specialties at Yue and refreshing drinks at Connections Lounge. 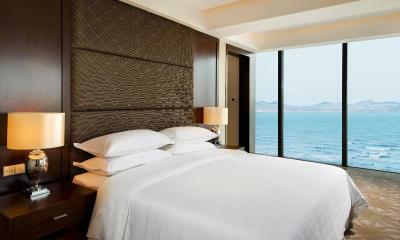 Fushan is a great choice for travelers interested in sandy beaches, tranquillity and seafood. 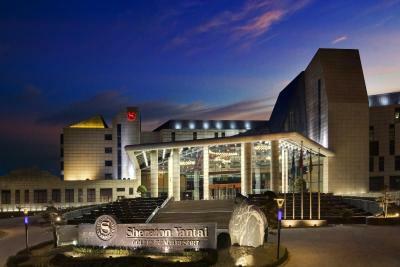 When would you like to stay at Sheraton Yantai Golden Beach Resort? This double room features a hot tub, electric kettle and air conditioning. This double room has a hot tub, air conditioning and bathrobe. 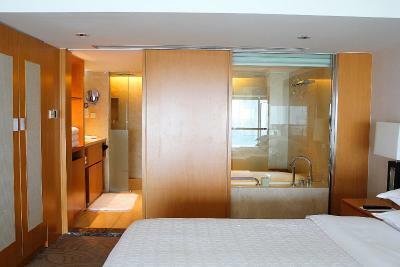 This double room has a mini-bar, bathrobe and sofa. This double room features a hot tub, sofa and bathrobe. This suite features a electric kettle, bathrobe and hot tub. 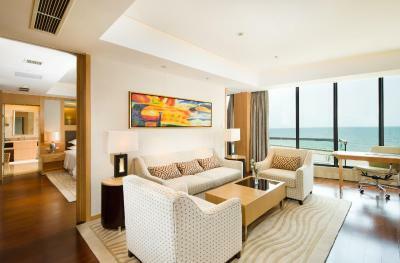 This suite has a sea view, mini-bar and executive lounge access. 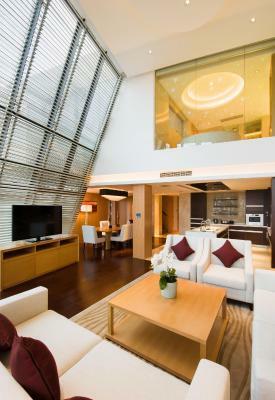 This suite features a mini-bar, hot tub and air conditioning. This villa has a executive lounge access, bathrobe and private entrance. A sophisticated retreat from the crowds and hectic pace of the city, our resort is well equipped to keep you refreshed, relaxed, and connected. 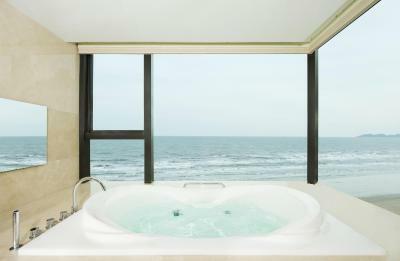 Indulge in a treatment at our tranquil spa or simply stroll along the pristine beach. Stay in shape at our fitness center, play a match on the tennis court, and swim laps in our indoor pool. Area Info – This neighborhood is a great choice for travelers interested in sandy beaches, tranquillity and seafood – Check location Good location – show map Guests loved walking around the neighborhood! 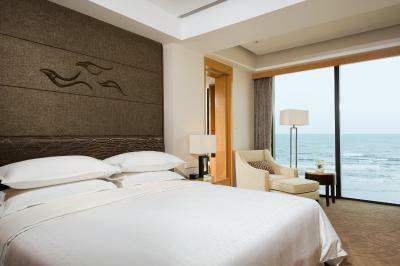 House Rules Sheraton Yantai Golden Beach Resort takes special requests – add in the next step! 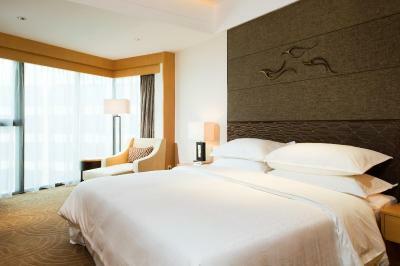 One additional older child or adult is charged CNY 300 per person per night in an extra bed. 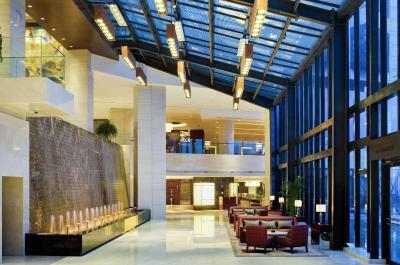 Greatwall Peony Dragon Jin Sheraton Yantai Golden Beach Resort accepts these cards and reserves the right to temporarily hold an amount prior to arrival. 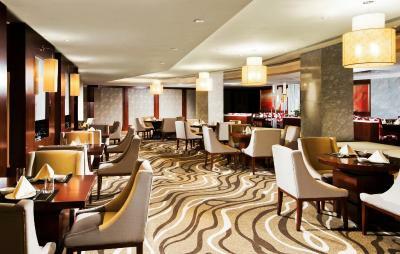 Sheraton Yantai Golden Beach Resort accepts these cards and reserves the right to temporarily hold an amount prior to arrival. The property will be going through swimming pool renovation from 25 August until 2 September 2018. During this period, the swimming pool is closed. The property apologizes for any inconvenience caused. The food was terrible. All buffet food was dry and coffee machines were dirty. Even Chinese restaurant was horrible. I do not recommend any food in the property at all. The hotel staffs were kind. Beach, buffee breakfast, swimming pool. Unfortunately the women’s changing room was abysmally untidy. Sadly the bathroom walls looked like they’ve not been cleaned in eons and the fixtures were falling apart. The jacuzzi was a huge empty hole. The steam room was out of order. This is Sheraton after all and it wasn’t up to standard. Hopefully the renovation to the front of the hotel will be over before summer kicks in. The staff is pretty nice, especially receptionist Haiqing Liu who helped me with checked in. We ordered a taxi through the hotel and were not very happy. We took a taxi from the railway station to the hotel and cost us 50 RMB and only 30min. The taxi from the hotel cost 70 RMB and took 50 min. No fresh squeezed orange juice at breakfast... except if you ask and insist to get one... And finally I got a small one.